An encore at the Mandarin. After the rave reviews of one of the inspectors, a group visit to the Mandarin Oriental was recently enjoyed by five(!) high tea inspectors in celebration of a milestone birthday. 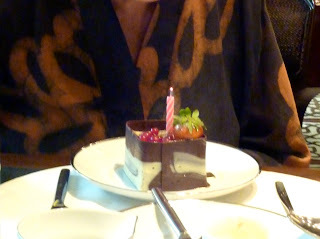 The big "six-oh" birthday indulgence was no secret from the staff at the Mandarin Oriental, who made the occasion especially memorable via an impromptu and soulful double rendition of "Happy Birthday" complete with violinist and bonus cake. The collective inspectors found the earlier review accurate. The food and tea selection is impressive and well executed. Thoughtful details, such as the unique tiered presentation stands, and fruity derivations of standard favourites make this a standout high tea destination. It is very handy to the Petronas Shopping Centre - use the Emporio Armani exit and skip on over!